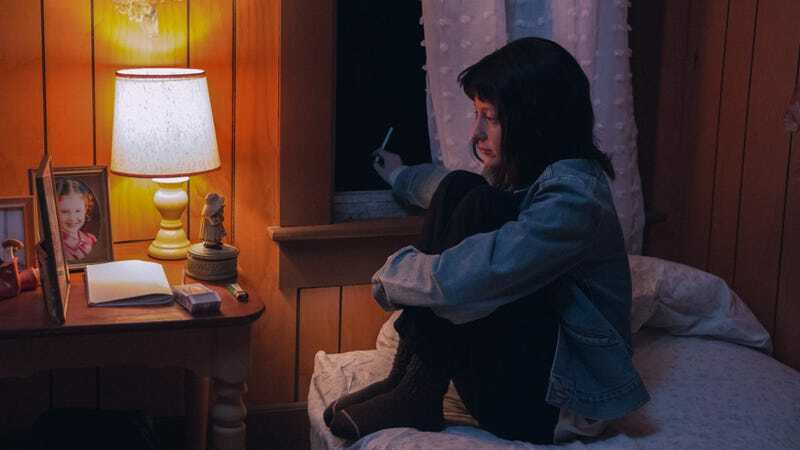 The “unlikable female protagonist” subgenre finds a worthy new entry in Nancy, the Sundance-winning feature debut of talented writer-director Christina Choe. In an emotionally ambiguous, formally restrained tale of intentionally mistaken identity, Nancy sets its title character up as a lost, lonely woman in an alienating world, then pushes the audience’s sympathy for her as far as it can go. 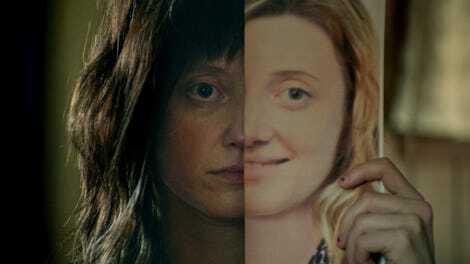 The Death Of Stalin’s Andrea Riseborough, transformed with a drained face under heavy brunette bangs, stars as thirtysomething Nancy Freeman, living at home with her disabled mother, Betty (Ann Dowd), in a cold, dying, perpetually overcast New Jersey town. Like pretty much everyone in 2018, Nancy is obsessed with the internet and spends most of her time scrolling through feeds to avoid facing the grimness that surrounds her everyday life. Unlike most people, she’s also a compulsive liar, showing her co-workers doctored photos of her “vacation” to North Korea and strapping on a fake pregnancy belly for a coffee date with Jeb (John Leguizamo), a fan of Nancy’s completely fictional blog about the loss of her “first” child. After Betty has a stroke early on in the film, Nancy’s inability to cope with her guilt leads to her biggest and most desperate ploy yet. Alone in their small, junk-filled home, Nancy sees a news report profiling a couple, Ellen (J. Smith-Cameron) and Leo (Steve Buscemi), whose young daughter went missing 30 years earlier. The police sketch of what that woman might look like now resembles Nancy, enough for her to become convinced that Betty is not her real mother, and actually kidnapped her from Ellen and Leo those many years ago. So Nancy calls Ellen and tells her she’s their long-lost daughter, and immediately drives several hours to meet her shocked “parents.” Leo and Ellen are everything Nancy wants to be: successful, educated, financially comfortable, well-connected. And so begins a grift so cruel, it’s practically emotional terrorism. Or is it? Choe keeps emotional truths obscured and questions unanswered throughout the film, creating a feeling of unease that gives this quiet film the texture of a thriller. The entire plot hinges on a DNA test that will prove whether Nancy is Ellen and Leo’s real daughter or not, seemingly building toward a confrontation that, in many films, would serve as the climax of the movie. Nancy is too elusive for that, though; it communicates mostly through subtle expressions, body language, and telling turns of phrase—an excellent example of the screenwriting maxim “Show, don’t tell.” (The jury at this year’s Sundance Film Festival agreed, awarding Nancy the Waldo Salt Screenwriting Award.) The cinematography is similarly subtle, expanding from a boxy 4:3 aspect ratio to fill the screen as Nancy’s world opens up. In the end, Nancy is a bit too dogmatic in its refusal to provide easy answers, its emotional impact dissipating like dust in a sunbeam with every understated non-revelation. As a statement on the malignant loneliness that’s infected America over the past several decades, however, it’s skillfully done, particularly for a debut. It also works as a star vehicle for Riseborough, who gives Nancy a deep hopelessness and passivity that makes her feel like a victim, even as she manipulates those around her. She holds her own alongside Buscemi and Dowd, both of whom excel in roles that call for a combination of weariness and warmth; Riseborough is chillier, with a blank expression to match the film’s dim natural light and snowbound working-class milieu. She blends into her surroundings, which may be the saddest and most unnerving thing about her.